Piece in London by mobstr. Photo by RJ Rushmore. The previous chapter was about how the importance of physical locations has changed thanks to the internet, the global track. That shift tends to be the default response when you ask people what the internet has done for graffiti and street art. People often get to thinking about style, about how styles are meshing and spreading around the world as local styles disappear or at least become less geographically focused. 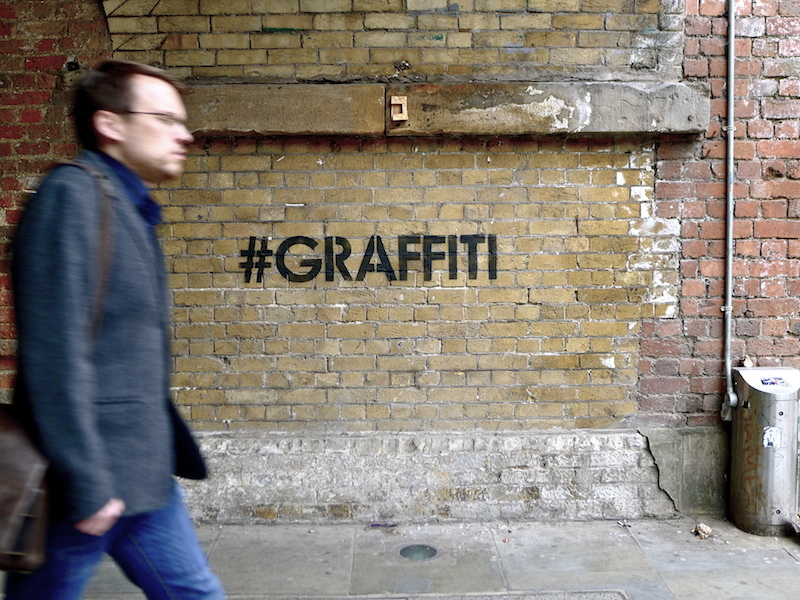 But that’s only one component of how the internet has affected street art and graffiti stylistically. What might not be so immediately apparent and what doesn’t always come up in those conversations are the trends in style that the internet facilitates, not styles that have spread to new cities because somebody saw something online and decided to try it out, but styles that beg for documentation and an effective mode of sharing. These are styles whose popularity is largely due to the internet, styles of work which, although perhaps possible 20 years ago, would have not been able to catch anyone’s attention, but now they have. In a sense, I’ve already touched on this a bit with examples like JR’s work in Kenya and Brazil or the active choice to work in abandoned spaces, but the styles and techniques I want to highlight in this chapter go beyond just messing with location or dislocation, although that can play into it. Specifically, I’m talking about styles like ad takeovers, op art on the street, tape art, yarn bombing, videos and conceptual street art and graffiti. It would be a shame to pretend that everything the internet has done for street art and graffiti has been for the better. This chapter ends with a brief but serious look at some of the criticisms of the structures supporting these cultures online and what the internet has done to the fans, the artists and the artwork. We’re moving, but are we moving forward? Kyle Chayka has highlighted some examples of how traditional visual artists have adapted to the potential for their work to be distributed online and go viral. If Chayka is right that this is essentially an inevitable evolution, shouldn’t street artists and graffiti writers be making similar adaptations? The street artists and graffiti writers pioneering and embracing the stylistic changes that I’ll cover in this chapter are the ones who have begun to adapt their art to the global track just like early street artists and graffiti writers had to adapt their art to the realities of working outdoors and illegally.